While it’s exact purpose is ambiguous, Trajan’s column certainly serves to commemorate Roman victory in the Dacian Wars (101-106 AD). Most believe that the content depicted on the column would have relied to some extent on Trajan’s Dacica, his personal narrative documenting the Dacian campaigns; however, only four words have survived from this work, making the column a primary source for military and topographical information regarding these campaigns (Davies). The official explanation is that Trajan started the war because he wanted to end Domitianic payments to the Dacians and halt the aggressive activity of the Dacian chieftain, Decebal (Salmon). However, the commencement of the First Dacian War has a combination of reasons; the attractive wealth of the region, restoration of Roman prestige, and personal glory for Trajan himself may all have played a part. The Second War has a simpler explanation: Trajan wanted to divide the trans-Danubian tribes by establishing a province in their midst. The events carved on Trajan’s column are incredibly detailed and precise. It is suggested that each scene is clearly based on a careful sketch that must have been made in the area from actual details on the spot (Richmond). The Romans are generally presented much in the way we would expect to see them, marching behind standard-bearers, headed by horses and grooms of the emperor, and armed in cuirass, shield, gladius, and spear. Although gone now, many of the javelins and spears were actual metal that added more dimension to the carvings. Most of the legionaries have long curly hair and beards, with only a few following Trajanic fashion of straight hair and a clean shave (Richmond). Even the Dacian physiognomy of aquiline noses and high cheek bones have made their way onto the columns (Richmond). They fight using flat oval shields and the curved Dacian blade, the falx. Right down to the scale armor on the horses of the Sarmatian cavalry, Trajan’s Column presents a detailed historical record. While it is detailed and seemingly accurate, onlookers should take care to remember the possibility of propaganda politics and watch for the effects of artistic license. Davies, Penelope J.E. “The Politics of Perpetuation: Trajan’s Column and the Art of Commemoration.” American Journal of Archaeology, Vol. 101, No.1 (Jan. 1997) p.41-65. Web. 13 March, 2012. Richmond, I.A. 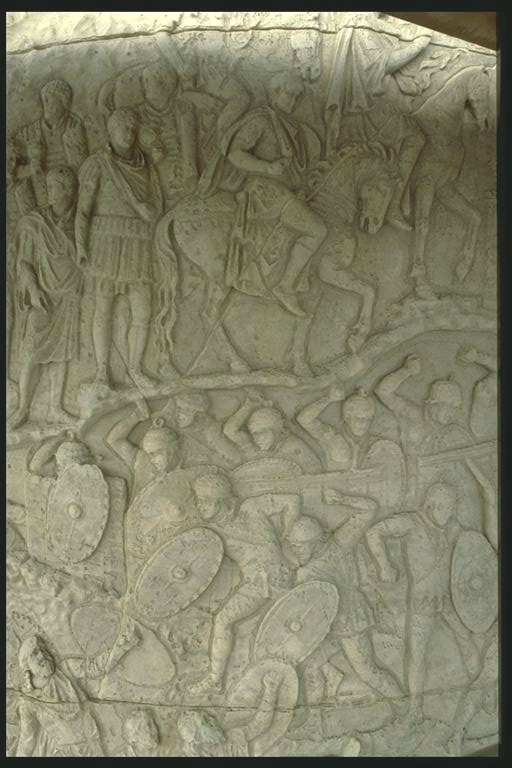 ”Trajan’s Army on Trajan’s Column” Papers of the British School at Rome, Vol. 13 (1935) p. 1-40. Web. 14 March, 2012. Salmon, Edward Togo. “Trajan’s Conquest of Dacia.” Transactions and Proceedings of the American Philological Association, Vol. 67 (1936), p.83-105. Web. 14 March, 2012.